It has the feel of many 50 to 60 episode long shows but with only 12 episodes. What I mean by this is that the story would have been told better if it were considerably longer. Instead we are given drastic character mood swings that seem to be brought on by minor events, useless characters that add nothing to the story, and a villain with what is probably the worst motive I have ever seen. In the end it left me with the sense that nothing important got accomplished and though a second season would continue the story I cant say that I'd be willing to watch it. It got to the point where I finished it just because I had already watched so much of it, not because I was looking forward to it. Not the Story Yuu Watase Wanted...Go in with an Open Mind..
Arata isn't completely horrible when you go into it not expecting it to be an actual Watase story. Unfortunately, Watase had many hardships in writing the 22 volume manga which got rectified too late to save the anime. Below is a link talking about how editorial harassment ruined Arata's story as well as almost ruined Watase's want to create more manga. Arata the Legend's first season has recently finished airing. 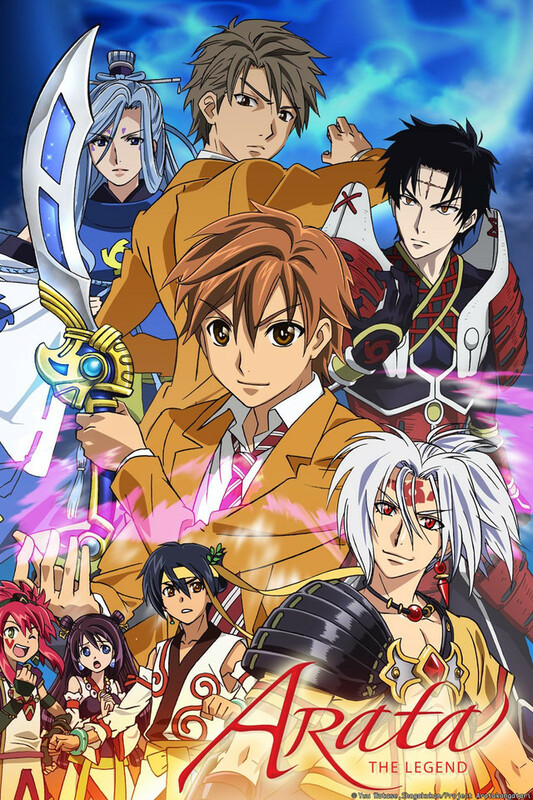 It is an anime about a world governed by a Princess and her 12 Guardians/Advisers called 'Shinsho' - warriors chosen by magical weapons called 'Hayagami'. The story starts with the Shinsho betraying the princess and attempting to kill her, and using the main character as a scapegoat for their ambitions. And thus begins the first season of Arata the Legend. Arata: The Legend's character roster is strong, featuring a few characters with some real potential. There are only two problems... the first, and most damning, is that the main character is not one of these. Arata Hinohara is an incredibly unlikable character who is clearly designed to be that way for the sake of plot-based character development. If that development had been smooth and gradual and logical, this might have been forgiven - unfortunately that is not the case. The other notable exception is the main villain, Arata's rival. He is psychotic for the most unbelievable and truly pathetic reason. Having these two characters be so critical to the story makes the show so much harder to truly relate to. The other critical flaw is that as the story progresses more and more of the potentially interesting characters "submit" to either Arata or one of his rivals. The concept of submission is a mostly sound one, save the fact that it is a completely illogical succession process. You see, 'submitting' refers to surrendering your power, knowledge and your weapon to someone you feel worthy of it. Where it falls through is that you also have to give up your life. If the people wielding these weapons were legendary warriors, guards, forbidden from holding office and so on... then we'd have a really interesting prospect albeit not entirely unique. But that's not the case here, everyone in any position of power, nearly, is a wielder of one of these weapons... and the people seeking to rule the country must apparently 'collect them all'. So basically after this process is completed you're left with nobody who knows how to govern except the 'winner'. That said, if you can look past the strange submission concept the show uses, the story is actually pretty good and very relatable. The 'Megaman' like aspect his weapon gets is kind of intriguing, although sadly as of the end of the first season it hasn't really been made use of. Essentially these Hayagami - the swords/weapons - are spirits of power that bond with a person and allow them to have insight and control into various things. But they aren't just the standards like 'I can control fire!' although those are present. They also make use of concepts like commerce, with one of the swords allowing for an understanding and manipulation of money, or justice, with a sword that allows it's user to see into the hearts of others and judge them. And when the owner of this Hayagami uses it, his main weapon transforms into the appearance of the other one he wants to use and gains it's powers. I'm really interested to see where they take this if they do a second season. Arata The Legend has a crossover between the real world and this fantasy world, but doesn't make good use of that fact. It isn't like Inuyasha where the 'real world' is just used as a relating point... there are moments where they are very clearly trying to build the real world into part of the story. They just fail at it badly, which is a pity. Not that the fantasy world is bad - it truly isn't. It's a very interesting place, but when you have this duality present I think you have to either use it, or dismiss it entirely, and the halfway mark just isn't engaging. I'm not really sure why I am interested in seeing more of this show, as there isn't a whole lot that's good to say. The action was a little bland, character development was awkwardly handled, the main character is pathetic, and they aren't reaching the potential that many of the aspects of the show present. And yet, I am. I hope a second season is made. I guess it is more about hope than reality, because there is a lot of potential... and perhaps after the 'growing pains' of the first season, things will improve. I wouldn't say I disliked the first season, but it certainly didn't live up to my hopes. Sadly this isn't on par with Yuu Watase's other works such as Fushigi Yuugi, Alice 19th, and Absolute Boyfriend. Character development was really slow and used cliche scenarios. Perhaps I just got tired of the same stuff. (No way, I was able to go through both Fushigi Yuugi versions). Then again I didn't like the anime version of Fushigi Yuugi and I haven't checked out the manga for Arata so perhaps I may enjoy. However for this anime, I definitely wouldn't rewatch and I'm using it to procrastinate with no success as I find myself returning to my homework unlike yesterday when I threw it in the corner to pay attention to Attack on Titan. Slow start, but definitely worth a watch! As a warning, the series starts off slow. Most of the first few episodes deal with Arata Hinohara (the protagonist) whining about trust issues, and being chased. The pacing on these episodes is kind of slow. Around episode four or so, the series takes a turn for the better. The pacing seems to become better, the plot becomes better, the characters (including Arata H) become better (in fact, Arata H becomes one of the better characters in the show), and episodes just seem to end so fast. Overall, this series has a great plot, great characters, and is one of those series where you won't be able to wait for the next episode. The only issue I see in the future is the fact it's only 12 episodes. I've read the manga version of this, and I know that they will not come close to reaching the current chapters of the manga by episode 12. They probably won't make it past volume 5-6, IF they even make it that far. And that's not a good place to end the series. Nothing would be resolved. I hope that the series gets a second season or something, because 12 episodes isn't enough for this series. To put a manga series in an anime is nothing new but since I have actually read most of it before this release I can say after seeing it so far it is not that far of from the dedicated artist's manga series. There are some scenes for the manga I am looking forward to seeing animated since the artwork in this series does it justice. And I do agree it may not be the best of the season but if it keeps to its original story line as it does now it will not disappoint anime fans. If you guys thought Naruto's Lecture-no-jutsu was bad, this guys talking-no-jutsu is even stronger. It pretty much makes up the bulk of all the fights. Bad pacing. Jumps between plot, and inconsistent pacing. Psychotic characters. They change quite often for no reason. Stupid Motives. Yeah, its lame. Watch it, and you will cringe. I guarantee it. Okay fighting. Yeah the fighting is half decent. All in all, it is more of a psychological action drama, but without all the logic that comes with it. Yup. Its pretty bad. I recommend the Manga instead, at least, that way, you wouldn't be wondering what the hell is going on, or why the characters have multiple personality disorder. In a story that appears to be aiming for exploring the different types of relationships, Arata the Legend falls flat on its face. By the time motives are exposed, the show is over. By the time the whining about how hopeless the protagonist is ends, so does the show. The ending clearly indicates an indication of a second season even though one can not be found. Arata the Legend shows a lot of potential, but also a TON of need for improvement. The pacing of the episodes is awful, with most of the episodes feeling forced, while the others feel like they are trying to fill time until it is to late to end where they wished. The voice acting isn't bad, but the captions clearly add text. I'm sorry, but a single word answer is not 2 sentences of dialogue. The animation tries to be flashy and exciting but winds up looking like someone was just playing with glitter. The facial expressions are done with comic book exaggeration for the mildest of emotional scenes while those that have the potential to be forceful are devoid of it. For all of its flaws, Arata tries to tell a story. "Tries" being the keyword since they give just enough information to understand what is going on, but then stop the show. If another season were to come out, then this show might redeem itself. But, for now it ended after just 1 season and that is 1 season to long. So far this is a good show. It's a pretty good show, i just fnished ep 4, it's not ground breaking, insanely original, or super duper awesome but it has a good story so far, entertaining, and enjoyable, i suggest you give this a chance.